The commercial adoption of drones is growing quickly, and electric utilities and co-ops are no exception. 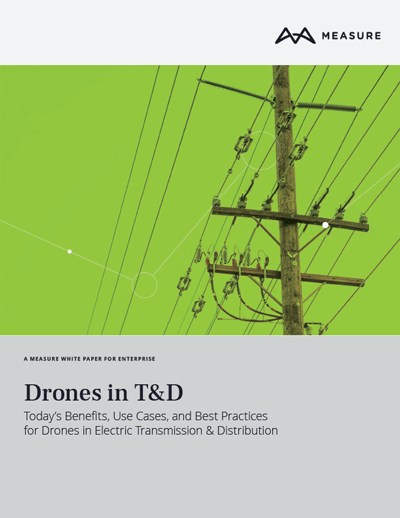 Drones provide a practical solution for the inspection of transmission and distribution (T&D) lines, as well as substations. Drones support business efforts to avoid hazardous man- hours; reduce costs for maintenance, inspections, and repairs; and minimize downtime. Valuable use cases have been proven with ground crews, linemen, plant managers, and engineers. Measure’s vast experience using drones includes providing actionable inspection data on thousands of utility poles and towers across the United States. Measure has conducted inspections for a variety of electric utilities, including companies such as Indianapolis Power & Light (IPL) and DP&L, both subsidiaries of our parter, AES, a global Fortune 500 energy company. Measure has also trained these and other energy companies on how to safely operate drones and manage an internal drone program. Federal regulations, such as the current restrictions on flying drones beyond the visual line of sight (BVLOS), are a common topic of discussion in the industry. Certainly, the use of drones in T&D will grow even faster as regulations are loosened and better airspace management and waiver application tools become available. Some organizations are already testing BVLOS operations, and, should you be interested in taking this step, Measure can help. However, through this white paper, we hope that you will find that drones can deliver real value to your organization today - using current technology and under current regulations. There is no need to wait for future advancements. The future is now. Drones provide safe, efficient inspections and data collection for businesses across the energy industry. Trained pilots and experienced data analysts use drone technology to drastically reduce inspection time, save labor costs and reduce hazardous manhours, while providing higher quality data that enables companies to maximize energy production. Using drones in transmission & distribution today both opens up new possibilities and replaces existing work. Without drones, inspections are typically completed manually, using climbing, bucket trucks, long-range photography; or helicopter. Clearly, manual inspections involving climbing or using buckets introduce hazards that are avoided with drones. Ground-based data collection typically lacks the detail and flexibility that a drone can provide. Helicopters can capture data quickly and over large areas of land, but they are expensive, can’t operate near residential areas, and often miss finer defects (missing cotter pins, for example). While we expect the benefits and use cases for drones to expand further in the future, the technology available for use right now, today, already offers significant benefits. Easy-to-use, multi-rotor drones can complete detailed inspections of 5-6 miles of distribution poles per day capturing both thermal and RGB imagery. Teams will benefit from a higher level of detail - missing pins, rust, damaged insulators – compared to typical ground or helicopter patrols, and thermal imagery can quickly identify hot spots. The more detailed and accurate data delivered by a drone inspection can enable companies to proactively identify more defects, which could lead to fewer power outages and reduced repair costs. Utilities may find that they can save time and cost with drone inspections. For example, with a drone, substation inspections can be completed within an hour and no shut-down is required. Keeping ‘boots on the ground’ is one of the most obvious benefits of drones. Crews can get a close up view of a potential defect without climbing or using a bucket truck. Drones can also help avoid risks related to traversing across private property, accessing poorly maintained or dangerous right-of-way areas, and dealing with unknown conditions following a storm. Drones can also provide invaluable insights after a natural disaster when the terrain conditions may be unknown and fast response times are critical. Using drones allows quicker access to areas that may be blocked by water or fallen trees. Drones can collect information that can help you send the right equipment and personnel to the right location in order to restore power as efficiently as possible. Many of the commercial drones in use today are off-shoots of the recreational drone market. The types of drones that are commonly deployed by ground crews for line inspections or post-disaster assessments, such as the DJI P4P, are reasonably priced. Operation is also relatively simple making adoption easy and enabling quick return on investment. With a drone and licensed pilot readily available, this can be accomplished in a matter of minutes. Drones can be used in areas too close to trees or homes for helicopters and in areas that are difficult to access for ground patrols. You don’t need to trek across private property or difficult terrain. There are no hazardous man-hours involved. And you get a clean look at the tower in real time, allowing your team to properly diagnose the problem and suggest a remedy before you even leave the site. During routine maintenance, a lineman sees a potential issue with a pole. A utility company that has trained and outfitted their ground patrol teams with drones can direct that lineman to get a better look at the possible defect without climbing or using bucket trucks. During regular patrols, a team member can quickly deploy a drone to capture a higher level of detail and more easily spot potential issues. They can see things that they may have otherwise missed, better classify the problem, and determine the best course of action, all while avoiding hazardous manhours. A tornado has come through and damaged several towers in its path. Rather than putting men on foot to assess the damage across miles of terrain, you grab the drone and do a survey of the area. With the proper software, the photos are uploaded and stitched together with photogrammetry, creating one cohesive map. You’re able to see the path of destruction and key in on the damaged areas, allowing you to quickly and efficiently plan recovery measures. Today’s drones can also help with vegetation assessments in populated areas. Avoid traversing across private property or having to access right-of-way areas in what is often a tight, over-grown space between urban or suburban back-yards. 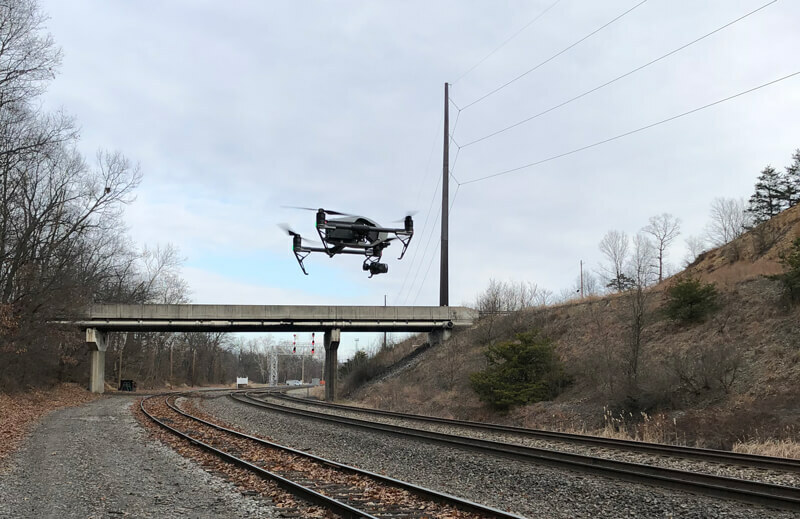 Using drones to inspect along the side of roadways may also help to avoid blocking roads or lanes of traffic with bucket trucks, and putting workers at risk. In the past four years, Dorsett has used the drone to help with painting projects, training, to take pictures for the Safety Council, for substation upgrades, fiber optic jobs, spot checks from the side of the road, and more. Dorsett and his coworker Jessica Franklin, Transmissions Operations Engineer, note that the most value is realized when you combine the abilities of the technology with the years of experience and knowledge of your team. Today, Dorsett is one of two licensed UAV pilots at Indianapolis Power & Light. He says he receives several requests each week for the drone and is grateful for his company’s commitment to innovation and technology. Once you’ve made the decision to add drones to your operations, it’s time to think practically about the setup and execution of your drone program. 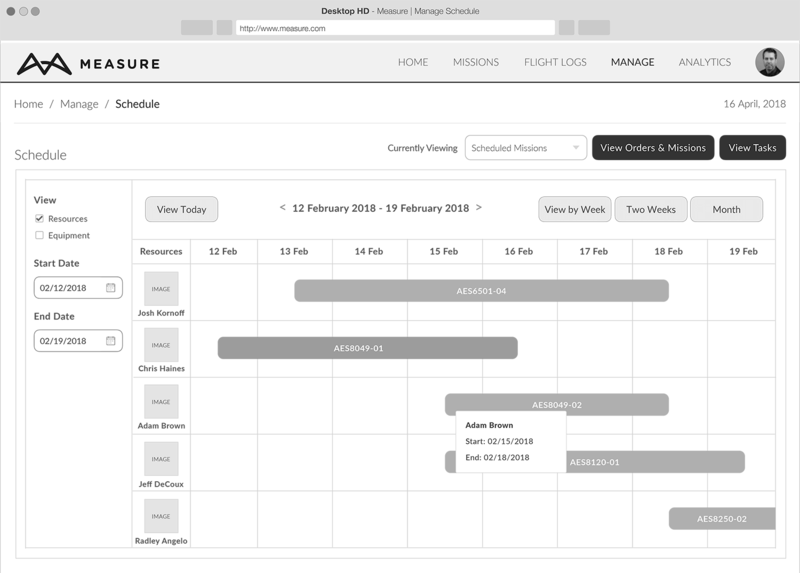 Managing a corporate drone program requires the coordination, oversight, and execution of a wide range of tasks and functions, as shown in Figure 3.1. How many of these functions your organization takes on, and therefore the size of your drone program team, will depend on the complexity of your operation and decisions regarding in-sourcing or out- sourcing. A helpful in-sourcing vs. out-sourcing decision guide is provided in Appendix A. In Measure’s experience working with energy companies, a hybrid approach tends to be the best fit. In this case, day-to-day and quick-turn operations are carried out by an in-house team while larger, more complex flight operations and data analysis are out-sourced to a third-party. Most companies will begin by designating an internal manager to lead the program and oversee the many moving parts. Typically this would be one person from a central location - a Drone Program Manager. For particularly complex or global programs, companies might need several people to manage operations in their region or for a certain type of operation (e.g. disaster response). Regardless of how you are structured, you will need a Grand Central Station, of sorts, to manage your company’s drone operations. The Drone Program Manager is responsible for ensuring all the functions of the program are running smoothly, whether accomplished in-house or contracted out. He or she will work with a team that might include in-house or contract pilots, trainers, drone engineers, and data analysts, among others. He or she may be ordering and/or tracking jobs; ensuring compliance with safety, regulatory, and company policies; managing equipment; and measuring program success. With so many people and functions to oversee, a program management software designed specifically for this purpose is crucial. Measure and Fortune 500 energy company, AES, use Measure Ground Control, a comprehensive software platform built based on real-world experience, to help run their complex drone programs. You’ll learn more about Ground Control later in this paper. An Air Operations Manual is the foundational document of a professional drone program. It shapes the operational and safety culture of the organization. Each Air Operations Manual will be unique depending on the attributes of your organization, but should always address the following subjects (more details outlined in Appendix B). An obvious part of any drone program is pilots. In-house pilots may be dedicated to the drone program, or they may combine drone operations with other job responsibilities. Often in the case of electric utilities, select team members obtain their pilot license for regular line patrols, spot checks, issue investigations, and disaster response. Third-party or contract pilots may be called in for larger projects. Application-Specific Training. Pilots should be trained to perform one or several specific industry applications. This might include such things as advanced flight skills for operating around high-voltage transmission lines, how to capture thermal imagery, or how to setup and fly a waypoint pattern. Pilots should also be trained on proper data handling for their specific use case, such as proper organizing and transfer of data files, as well as important data security techniques. The energy industry has always been a leader in utilizing Geographic Information Systems (GIS) and remote sensing data to monitor infrastructure and make decisions. From mapping out critical infrastructure to right-of- way management, utilities have built extensive databases of geographic information. One of the best ways to maximize the return on your drone inspections is to integrate drone data into your existing workflow. What decisions will the end user be making based on this data? What types of data need to be collected for the user to make those decisions? Are you using drones as a replacement for existing remote sensing technologies? If so, how do you use that data? Of course, if you are dealing with critical infrastructure, you must also ensure that all data procedures follow NERC/FERC compliance. 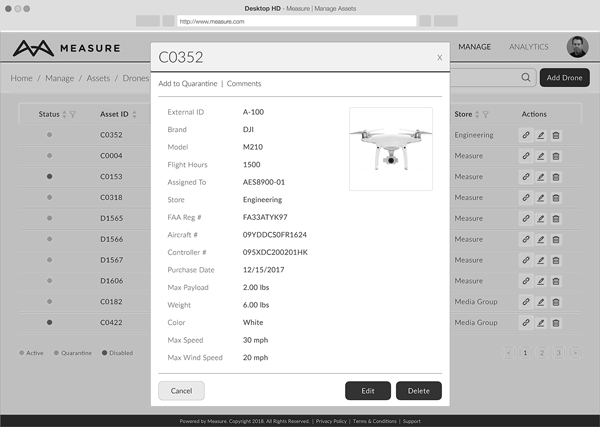 Next, compile an inventory of your existing data architecture so you can identify if you have the tools to store, process, and analyze drone data. Data capabilities will vary significantly by organization, and many organizations may choose to out-source some, or all, of their data processing and analysis needs. Even if you choose to outsource data processing and analysis, it is still imperative to determine how you will integrate the resulting data products into your business systems and workflows. Prior to flying, each pilot will need to understand the data required and any data collection or flight path specifications. If the data collected will require data processing and analysis, a pre-flight meeting with the data team is recommended. Drone data follows the old computer-science adage, ‘garbage in, garbage out,’ meaning no amount of magic can turn improperly collected data into a valuable data product. In order to ensure that the data collected meets the project needs, Measure pilots also conduct quality checks with the data team, typically at several intervals, during complex jobs. 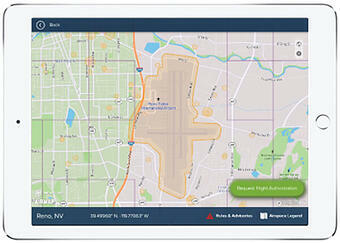 This helps to reduce the chance of having to return and re- fly a job site due to poor data quality. While some jobs, like a quick spot check of a pole-top issue, are fulfilled with the basic, raw imagery taken by the drone; other jobs, like mapping and maintenance or vegetation assessments, require the processing, analysis, and delivery of large data sets. Once data has been captured and transferred, it is loaded and prepared for processing and analysis. At Measure, we typically bring processed data into programs like Pix4D, ArcGIS or Scopito to perform analysis and share the final data with end users. 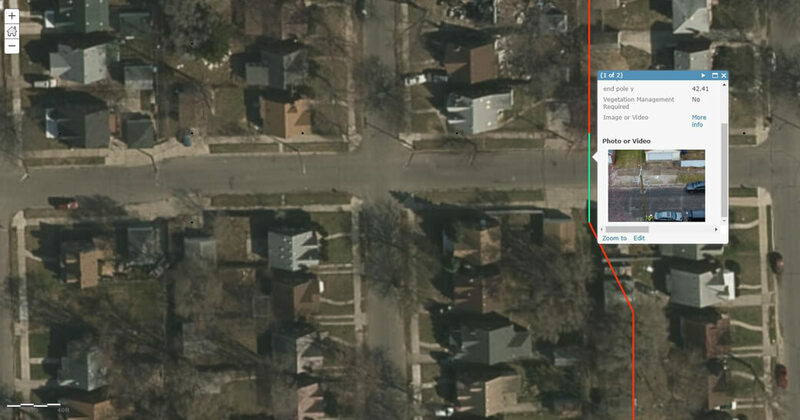 For energy inspections, we often use ArcGIS or Scopito (see Figs 3.2 - 3.3) to produce an interactive webmap that can be annotated. ArcGIS data can also be delivered through a convenient app, making it easy for field personnel to locate issues and provide updates right from their smart phone. 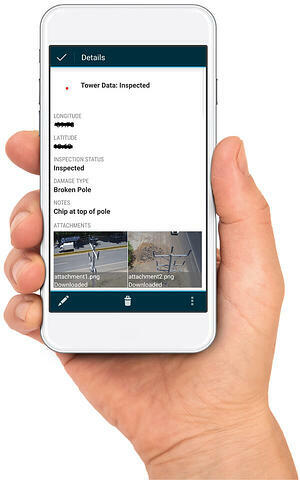 Figure 3.3 - Screen shot of a Scopito interactive web portal for a maintenance inspection. The next obvious part of any drone program is, of course, the drones. When choosing the right equipment for a job, there are a number of factors to consider: type of operations, data requirements, security requirements, and cost. Common drone platforms and sensor payloads are shown in Figures 4.1 and 4.2. Drone aircraft come in two major physical configurations: multi-rotor and fixed-wing. Simply put, for operations that require ease-of- use, maneuverability, and data collection in a relatively localized area, a multi-rotor drone is almost universally the right option. In the multi-rotor drone marketplace, DJI dominates with over 70% market share. DJI products offer quality and reliability at an affordable price, and they cover a wide range of applications and levels of sophistication. Standardizing on one drone manufacturer, or, if possible, one drone airframe, will simplify aircraft maintenance and repair. DJI’s market dominance and expansive equipment selection makes it an attractive choice. DJI has come under a certain amount of scrutiny for data handling practices. These can be mitigated by using a feature called “Local Data Mode” available in select flight control applications, such as Measure Ground Control (discussed later in this section). Operations that require long-distance flight or wide-scale mapping are typically better served by fixed-wing aircraft. Fixed-wing platforms lack the maneuverability and ease-of-use associated with multi-rotors, but offer superior endurance. Many applications suited for fixed-wing aircraft remain limited by FAA regulations prohibiting beyond visual line of sight (BVLOS) flight without a special permit. 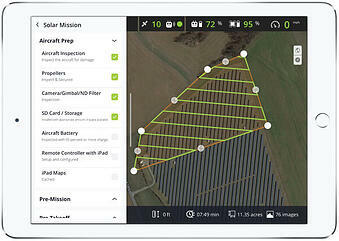 Measure currently uses the senseFly eBee for utility-scale solar power plant inspections with great success. The eBee is a fixed-wing drone that packs a lot of power in a small platform and accepts a variety of payloads, including visual, thermal, and multispectral sensors. However, using a single software solution for as many functions as possible - work ordering, resource management, flight planning and tracking, program reporting, compliance, and data management - will help you streamline your operations and manage your program more efficiently. You’ll also have the program oversight that most corporations, such as electric utilities, need to ensure consistently safe and compliant execution of all aspects of their drone program. 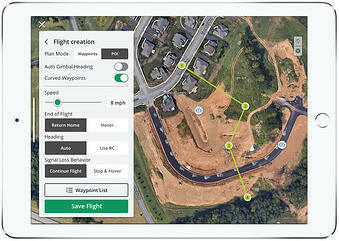 Drone data is often uploaded into various software platforms for processing, analysis, and visualization. Figure 4.3 summarizes just a few of the different software products used by Measure’s Data Engineering team. As shown in the Figure, different software platforms are best suited for different types of applications and data needs. Some tools are designed to be used only for raw dataset processing, while others are only useful for analysis or visualization of processed data. Analytical tools in particular are often targeted to a specific industrial application. For T&D work, Measure most commonly uses Scopito and ArcGIS. What data software you need will also depend on whether you will be processing and analyzing drone data internally, or whether you will be outsourcing this function. If you don’t plan to do internal data processing and analysis, you only need to worry about how to best integrate the final drone data product into your operations. 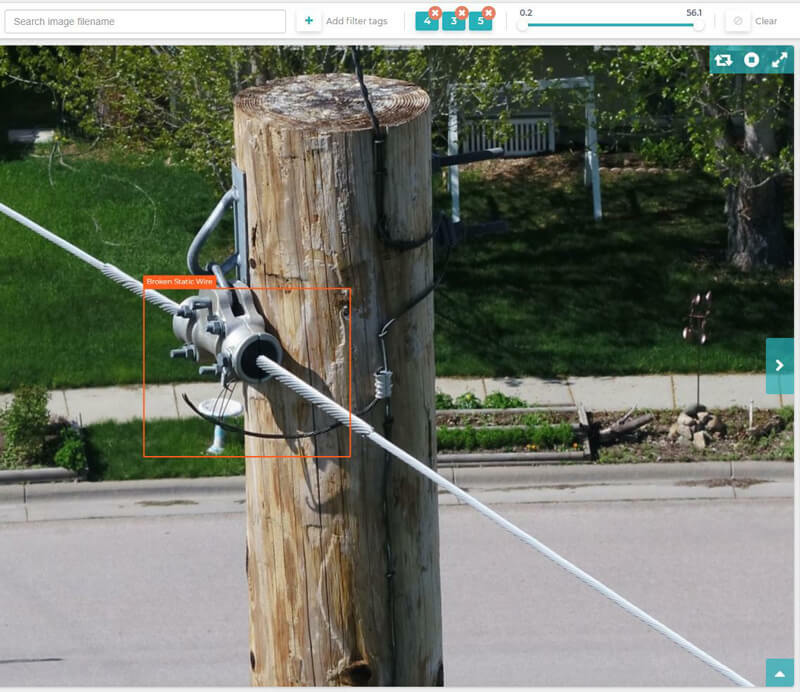 Many electric utilities will want to receive data in ArcGIS for integration into existing systems, while others will use a stand-alone data portal, such as Scopito, for viewing, storing, and tracking their drone data. If you will be using an outsource model, access to these platforms will typically be provided by your vendor. Please see Figures 3.2 and 3.3 in the previous section for examples of data delivery through ArcGIS and Scopito. In this paper, we have reviewed the benefits and use cases of drones in transmission & distribution operations. We have introduced the components of a drone program and discussed options for hardware and software. Everything is this paper is something your organization can do and take advantage of today. Drones can deliver measurable improvements for your T&D operations. 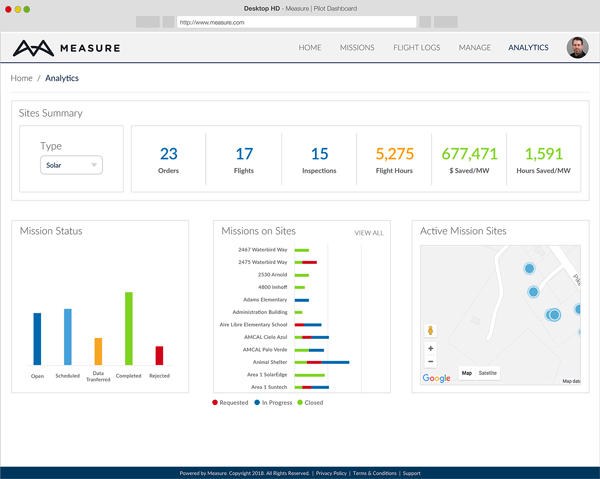 When you’re ready to get started or want to take your existing program to the next level, drop us a line at measure.com/contact.